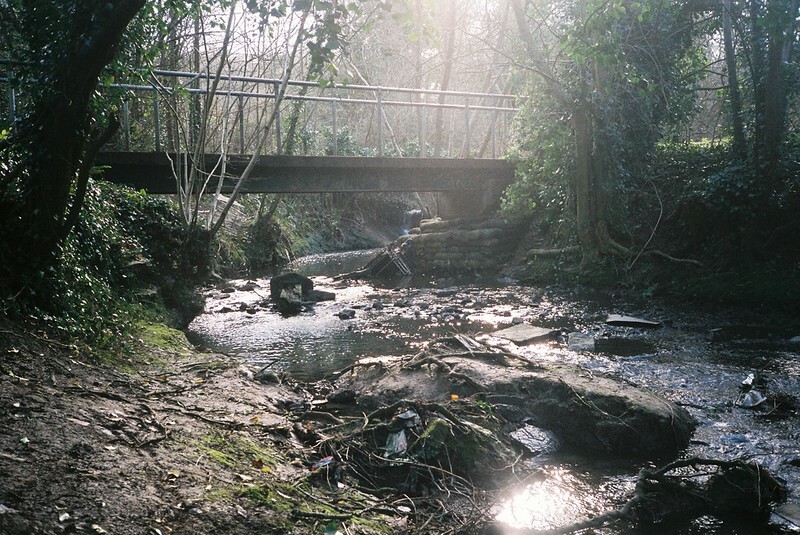 Crox Bottom is a little park, off Hartcliffe Way, where Pigeonhouse Stream (I really love the names!) runs from the lake at the old Imperial Tobacco Factory, down to meet and run under Hartcliffe Way, and then join up with the Malago. It’s a much bigger river than the Malago, and I don’t quite understand why it’s a tributary – but like the Malago, it’s taken underground by the Dreadnought Interceptor, a huge storm drain, so what passes out of the park is much smaller than what goes in. I walked it with my friend Cee and her baby, on a cold-but-sunny Monday. 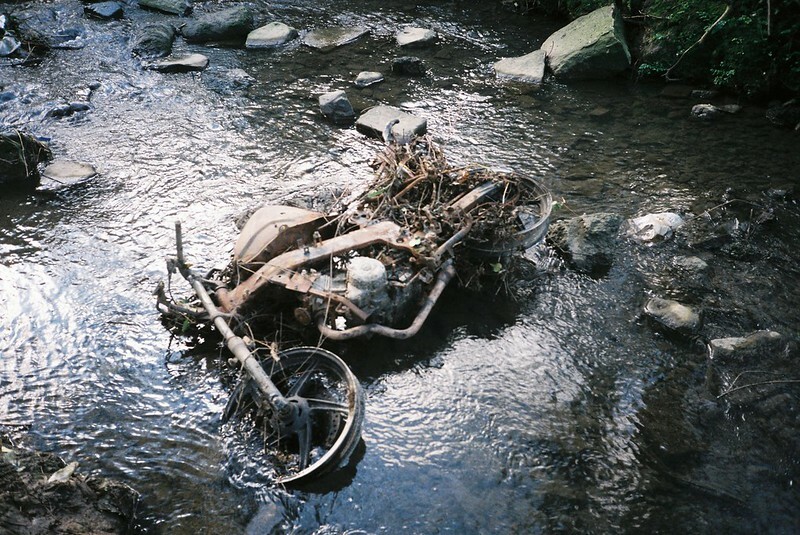 We’d both passed it in cars for years, and wanted to know more about it, so we parked at Imperial Park, walked down the bank along Hartcliffe Way (stopping to run across the road to see where the river comes out), and then back up along the river. My photos are below – mouse over or click on the first one and it should pull up the slideshow – or just head to the flickr album. The first thing we saw was the Dreadnought, and the structure fascinates me. I’d seen the Malago version with Cee when we walked up through Manor Woods Valley in the summer, and it’s always so interesting seeing the same structure again, but in a different place. If you want to see what it’s like inside, there are some urban explorations on google, like this one, this one and this one. The structures are like a house in the ground, built out of cages, with debris on top and washed alongside the edge, fenced in, but it’s easy to hop over that. 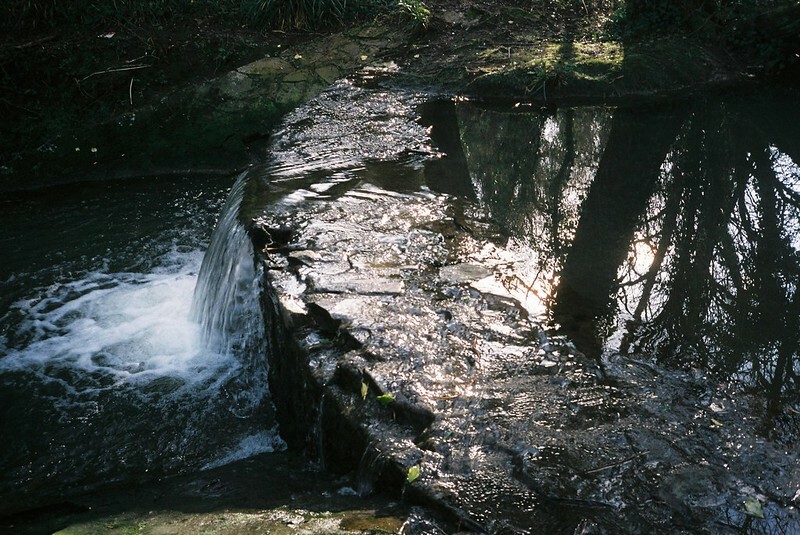 In the winter sun, it was full of shadows, and the rush of water as the stream flowed in then was shunted sideways, pushed down some steps and into the tunnels. One day I really want to explore down there too, and the little bits of graffiti showing where other people have make me smile. We walked on, and just like in Manor Woods Valley, the river has been very modified, full of weirs in the same stepping stone designs, or as a concrete ramp from the pool with ducks and an island, so the water moves between the rushing of the waterfalls to this calm pool full of reflections disturbed by a couple of ducks. 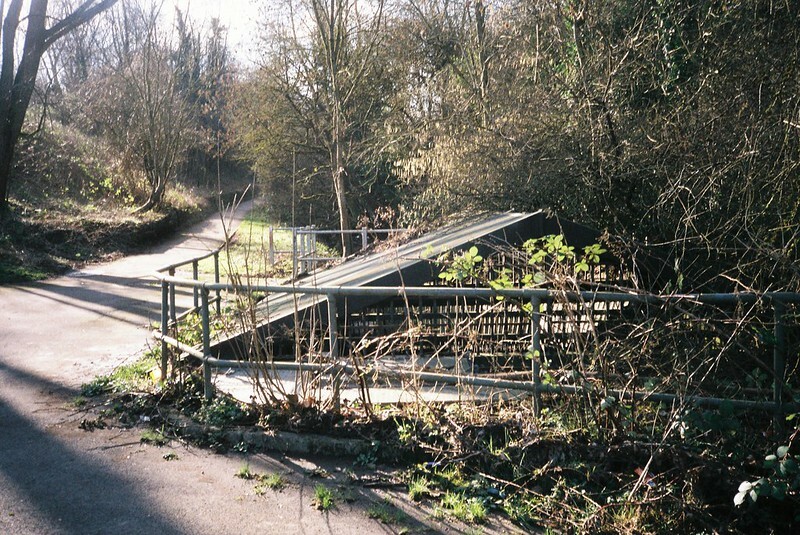 The park is landscaped, but the recent additions are harsh: concrete steps and bridges, handrails made out of scaffolding. It’s all very uncompromising, very urban. 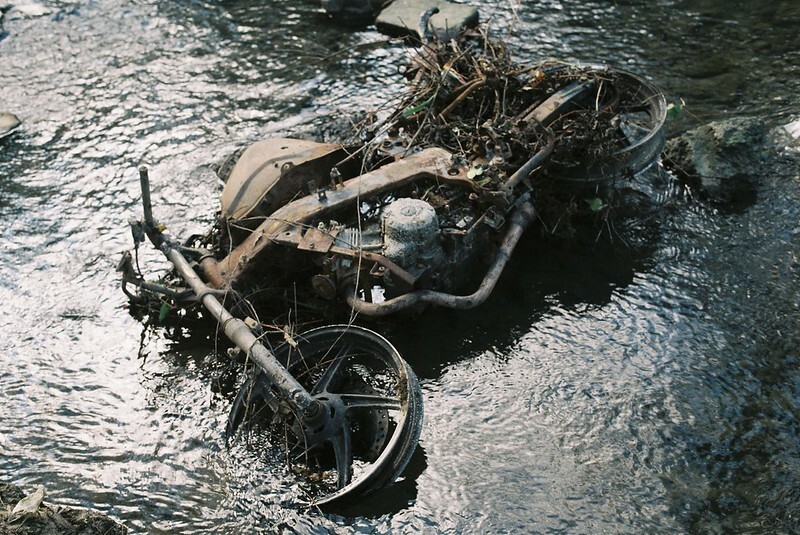 And one of those typically urban sights, a dead motorbike in the middle of the water. Our aim was to see the lake that the tobacco factory was built over, but since it’s been turned into the Lakeshore “luxury flats”, it’s guarded by ugly fencing, with warning signs outside and in, telling us proles we’re all unwelcome, and warning the residents that water can be dangerous. It was really sad to see these huge great fences everywhere, bisecting what clearly had used to be paths around the water, and made us wish we’d come here before the flats took over. I’m really supportive of brownfield sites being turned into homes, but that development by Urban Splash is defiantly refusing to be part of the surrounding communities in any way. We walked around the edge, and the fencing got more ridiculous, with a huge gate trying to block even views of the lake from people walking to the Imperial Park shops, the epitome of a development expecting people to drive in and out, living in an area but not being part of it.